Xtreme Hire aspire to be the leading provider of GoPro Camera Hire in the UK, providing excellent customer service at every stage of the process. We come from a background of action sports and we realise that it’s nice to be able to re-live some of those great moments. We also realise that the cost of decent recording equipment can be a little restrictive, especially for a piece of equipment you may only get out of its box once a year! We want to make it quick and easy to hire high quality equipment at the lowest possible cost letting you focus on filming great footage whether it’s a winter hoiday or part of a movie. 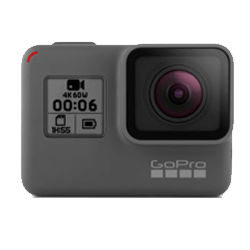 We're the first hire company to be offering the GoPro Hero 7 and the GoPro Fusion 360 for hire right now so be one of the first people to try out this great new technology! So are you taking part in some form of action sport and want to capture it in full HD? Then hire one of our GoPro Cameras; the latest and most advanced incarnation of the GoPro range of action cameras. Whether you are skiing, snowboarding, surfing, mountain biking, kite surfing, diving or anything similar, hire one of our cameras now to capture the action in stunning wide angle HD for you to re-live whenever you choose. We have a huge range of mounts to cater for any requirement so get in touch with us now to book yours. So what are you waiting for? Click on the Hire Now button, choose your equipment and get recording! All of the prices on this site are fully inclusive, meaning you don't have to worry about the cost of postage, memory cards or hidden costs when you return from your adventure. We can deliver to any part of the UK by Special Delivery, but we can also deliver in person if you've got a last minute booking. So what are you waiting for?